Excelsior Editions/State University of New Yo, 9781438452821, 99pp. In 1954, Karen Chase was a ten-year-old girl playing Monopoly in the polio ward when the radio blared out the news that Dr. Jonas Salk had developed the polio vaccine. 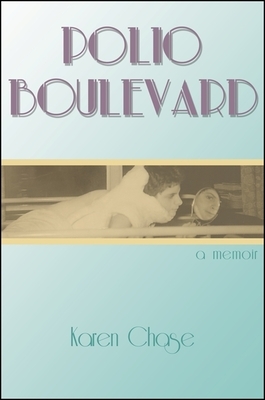 The discovery came too late for her, and Polio Boulevard is Chase's unique chronicle of her childhood while fighting polio. From her lively sickbed she experiences puppy love, applies to the Barbizon School of Modeling, and dreams of Franklin Delano Roosevelt, a polio patient who became President of the United States. Chase, now an accomplished poet who survived her illness, tells a story that flows backward and forward in time from childhood to adulthood. Woven throughout are the themes of how private and public history get braided together, how imagination is shaped when your body can't move but your mind can, and how sexuality blooms in a young girl laid up in bed. Chase's imagination soars in this narrative of illness and recovery, a remarkable blend of provocative reflection, humor, and pluck. Karen Chase is the author of two volumes of poetry: Kazimierz Square and Bear, as well as Land of Stone: Breaking Silence Through Poetry and Jamali-Kamali: A Tale of Passion in Mughal India.